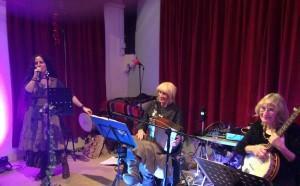 Ruth plays melodeon, Liz is on banjo. Antonella calls the dances whilst adding to the music with whistles and percussion when the dancers have got the hang of the dance. The band's music is principally from all parts of the British Isles, played in a very lively,energetic fashion.